For this month's "Maps of the Month" featurette, I wish to draw your attention to Alex Foster's Super Mario Kart (Super NES) maps. Now that summer's here, it's time for some outdoor fun! Bust out the go-karts! ...Or at least the Mario Karts! Super Mario Kart is the first of several Mario Kart games, and many maintain that it is still among the best of them, despite its now-antiquated faux-3D. In truth, the stages are just 2-dimensional planes laid out at an angle. The Mode 7 scaling and rotation of the "ground" in racing games was, at the time, still relatively new in console gaming, though Nintendo pulled it off well on the Super NES in both this game and F-Zero. Alex Foster has captured the original maps, as seen from a birds-eye perspective. You would never see the map as a whole like this in the game, so they're incredibly useful if you're planning routes and finding shortcuts to aid you in your quest to be the best Mario Kart racer. 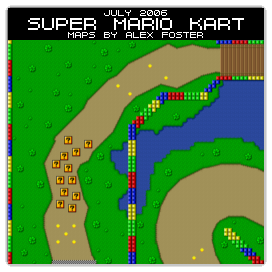 So to recognize the effort put into making these useful overhead maps, Alex Foster's Super Mario Kart maps will be known as VGMaps.com's Maps of the Month for July 2006.